Critter's Choice Tasty Sticks are hard and colourful, sugar-free chew treats which are the perfect luxury treat for any small animal. Wheat flour, eggs, oils and fats, yeast, EEC permitted colourants. Below are some recent questions we've received regarding Critter's Choice Tasty Sticks Small Animal Treats, including answers from our team. 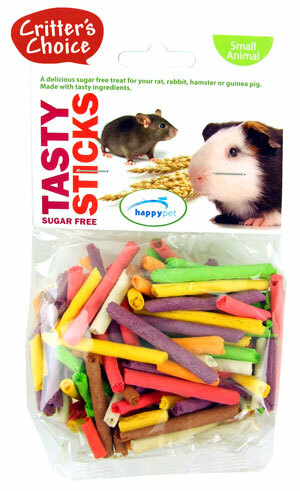 Are these treats ok for Syrian hamsters. Yes, these treats are perfectly fine for Syrian hamsters. Tasty Sticks would be suitable for Chinchillas. As they are sugar free and have a fairly low oil and fat content, they are fine to feed sparingly to chinchillas.